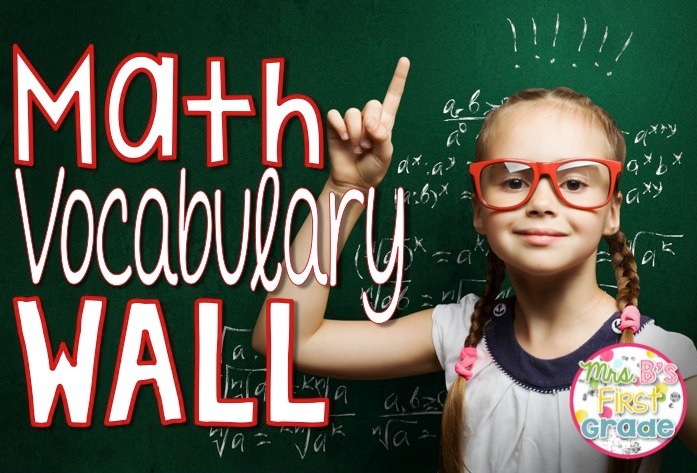 Vocabulary is one of those areas that I am never positive on how to teach. We had a program in the past, but after getting rid of it I have done something different every year. This year? I tried something new and it is actually working! Over the summer a few of my co-workers went to a vocabulary workshop for teachers. I wasn't able to go, but the main message that they brought back was that vocabulary should be content-specific and should not be taught in isolation, rather along with content area lessons. This sounds so simple, yet I haven't really ever done that. 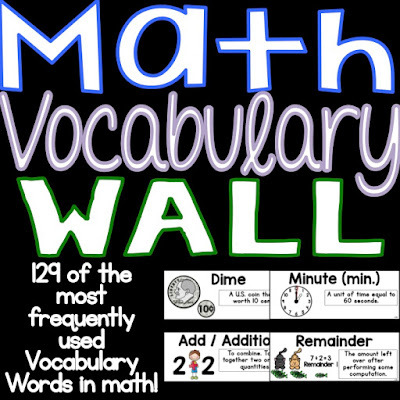 My math program had some boring vocabulary cards that I used to show my students every now and then and I made sure I used rich vocabulary while I am teaching, Explicit teaching during content areas though? I needed to get to work. I decided this was best tackled subject by subject. I decided to start with math because of the rich vocabulary I already knew was there. 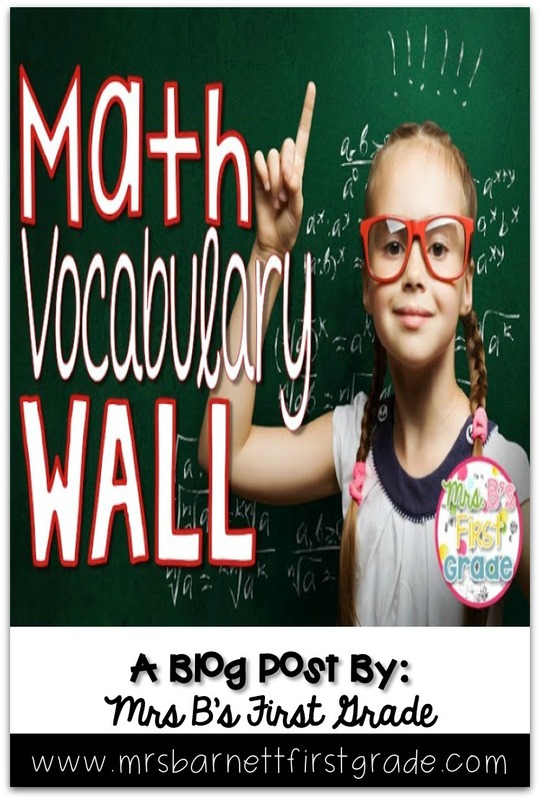 I first compared my math units with the vocabulary that was already in my math program and the Common Core State Standards. First grade math is basically broken into Addition & Subtraction, Measurement, and Geometry. 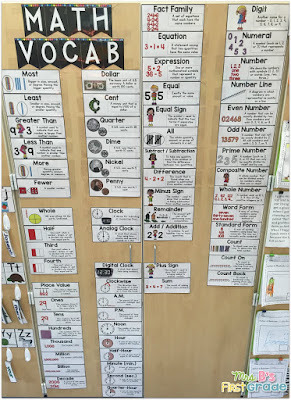 With the help of my school, we found the vocabulary words that are critical to learn and supplementary to learn. The next place I compared with was the NWEA MAP assessment. This is the main assessment my students take three times a year. I finally realized one of the main keys to moving up in RIT bands is to know more vocabulary. I used this website to help me compare the RIT bands where my students were and what additional vocabulary they would need to master in order to move up. Comparing these three resources I came up with a list of 129 math vocabulary words for my first grade students to master. The final step is to display. There are so many possibilities for this. I put the words we have mastered on a Vocabulary Wall. I put them up in categories because I believe that helps my students the best. 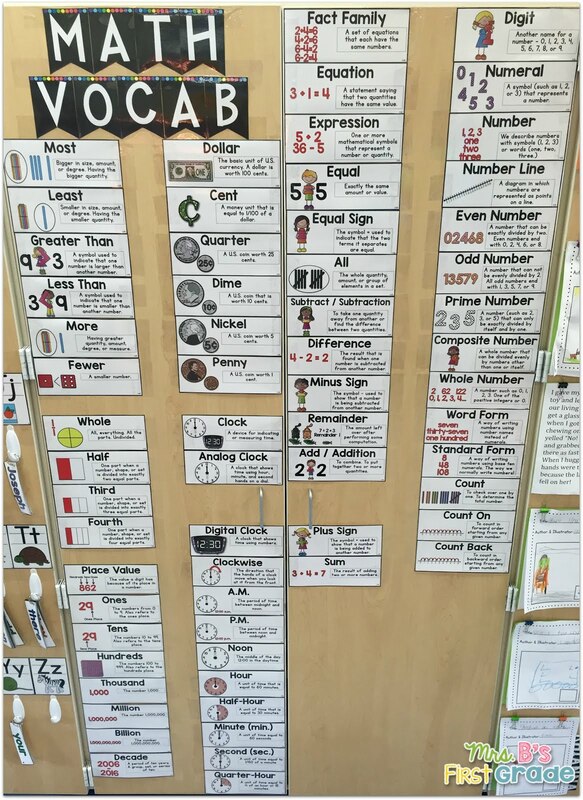 Alternatively, you could display the words in ABC order or even just display while you are learning and take down when you are done. You can also put words on a ring for students to reference in a more portable fashion. This is my current wall. I haven't taught Measurement or Geometry yet, so they are not added! 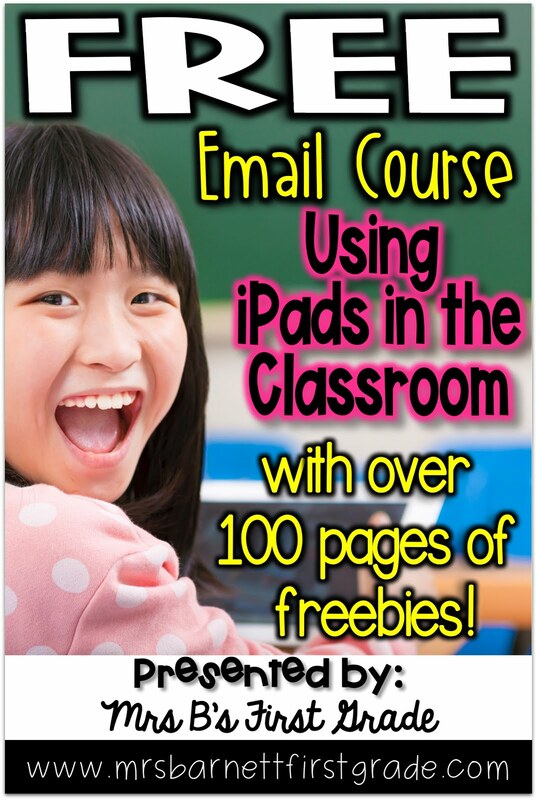 I hope the tips I have listed will help you in your classroom as much as they have helped me. To grab my vocabulary words, click the picture below. If you purchase the pack and have more words you would like to see added, just email me. I will happily make cards for you!